4) MOQ: 1ton. Usually 12 tons for a 20 feet container; 24 tons for a 40 feet container. A) EPE, waterproof paper wrapped in small bundles. 8) Sample design: It is better we can get your drawing or sample, we mainly make according to your design, and we can keep confidential for your design. 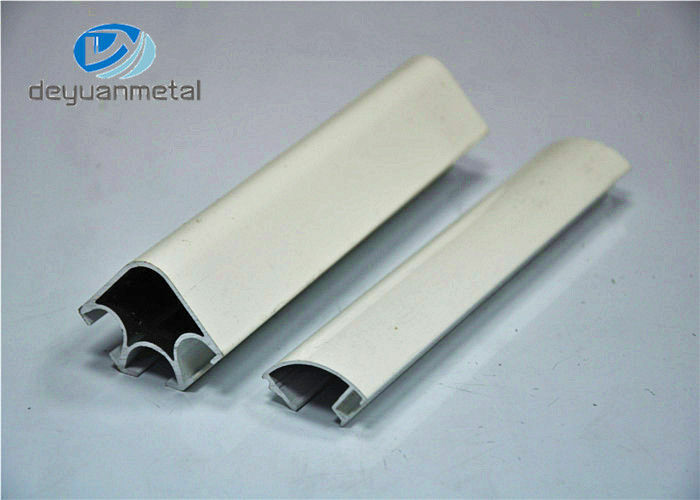 Extrusions is a producer of extruded aluminium profiles. Sites also handle cutting, bending, anodizing and painting. With production facilities across the world, Extrusions is organized in three business areas, covering the Americas, Asia, and Europe. Building Systems develops and sells aluminium-based window, door and facade products. This includes the development of energy-saving concepts. Our company has a portfolio Building System and Original Systems - to ensure a proper response to the various segments of the global market. With the implementation of Quality Management System , the company management is committed to providing products and services that comply with legal and regulatory requirements and that meet customer requirements , with a view to their dedication to the company. The company was certified by the independent TUV HELLAS, member of TUV NORD Group of Germany to implement a Quality Management System according to the international standard ISO 9001 of 1994 version , the first time, in June 2000 , while in July 2009 certified according to the new , improved standard of ISO 9001 version 2008. The extrusion process provides virtually unlimited opportunities for aluminium product shapes. Costs are cut by designing fewer components, which reduce fabrication and simplify assembly. An aluminium extrusion profile is the simple solution to almost all design problems. Aluminium instead of steel, wood or plastic. Extrusions are found in almost every industry and market application. They are in your home, your car, your office, in planes, trucks, trains and boats; in airports, factories, machines and power stations. Their versatility contributes to the performance of aluminium as the world’s fastest growing metal. 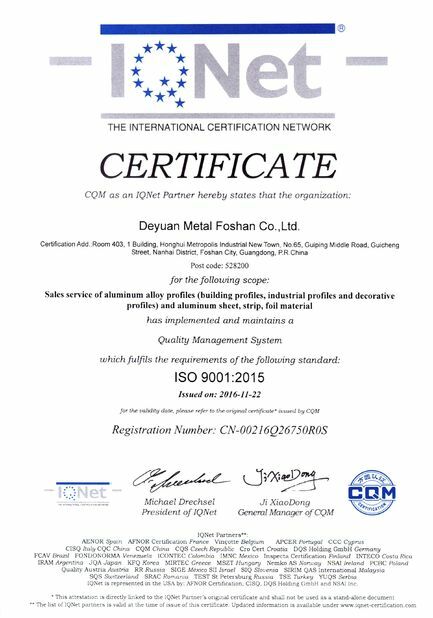 Deyuan Metal Foshan Co., Ltd. is a comprehensive and professional enterprise integrating research, design production and sales of aluminium extrusion profiles for construction and industrial applications. There are currently 26 aluminum extrusion process lines at 500MT TO 2500MT, 3 process lines for anodizing, 2 process lines for powder coating, 1 process line for painting, 1 process line of polishing and brushing. Our annual production capacity has reached 80,000 tons which is at the forefront of the aluminium industry in China.